Minnesota author Heather Holm’s latest bee guide has the detail to satisfy even the most engaged citizen scientists and the scope to give beginning gardeners ideas for creating bee habitats. Bees: An Identification and Plant Forage Guide (Pollinator Press, 2017) is a follow up to Holm’s earlier book Pollinators of Native Plants (Pollinator Press, 2014) and offers more detail on the bees themselves. This bee guide has three parts. It starts with a general discussion of bees, their life cycles, nesting habits, food sources and social organization. 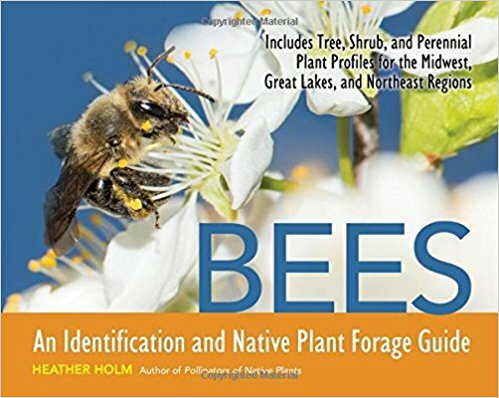 Holm follows this with specific listings of dozens of bees, with notes on where they can be found, their habitat and food preferences, pollination processes, social networks and preferred forage plants. The book ends with a description of many native plants that attract bees and provide nesting sites and materials. The beauty of this book is its detail. Holm shows readers the differences between bees, wasps and flies with pictures and words. Her photos of nesting sites will change how you look at holes in the ground forever. (Did you know 70 percent of bee species nest below ground?) Drawings and images show how bees reproduce, from mating to egg-laying, the forming of “bee bread” and beyond. In the section on plants, Holm includes photos and maps with each plant, showing where it is native. So, as I have been thinking about native plants for a new garden, I knew to skip over the wild senna and focus on liatris, sunflowers and wild geraniums, among many others. (The vast majority of the plants Holm lists are native to Minnesota.) The plant listings also include clear charts about sun exposure and soil preferences for each plant, making it easy to choose the correct plants for your site. The listing also lets you know which bees prefer which plants, so you’ll have a better idea of which insects are visiting your garden. In addition to a glossary, Holm ends the book with a two-page guide to constructive and destructive actions gardeners can take that affect bees. For bee lovers, native plant gardeners or those interested in science, this is an informative, useful, beautifully illustrated book.